Finally, we've received our brand new Pro2 camera on middle September, and now we have to do our first Job !! The work is for a car dealership, I showed them the example of BMW Renova that is in the gallery of the website of Matteport and they were in love with how you could get in the vehicles. My doubt is that I have a tripod manfrotto190Xc and I don't know if I will have enough space to be able to accommodate it inside the vehicle. Did somebody make it before or something similar? What gear have you used? In a few hours I will test inside my car with this manfrotto190X, do not hesitate that I will keep you informed of the result. Many thanks in advance to all, we are haunted with the forum and its tips. Great Job Dan and all the community. We hope to collaborate with our posts, you can be sure that this topic will be solved in this post so that other colleagues can find it. My son and I tried the inside of a Mercedes S550. 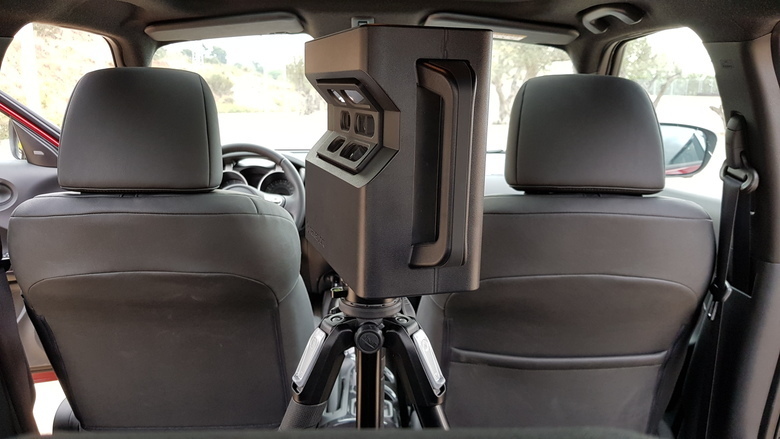 Because it has two large consoles, we thought we could use a smaller tripod and balance the Matterport camera on those. Nope. After much trial and error, we found that a full-size tripod (Manfrotto MT190XPRO3) was the only safe way to do this. Unfortunately, one of the tripod legs is in the scan. Good luck with your scans. 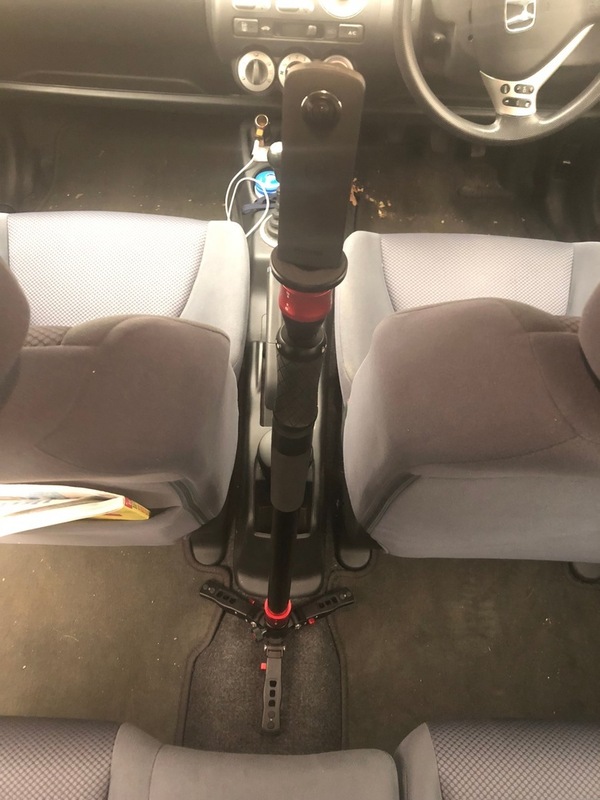 Get a wooden board or similar to place across the the drivers seat, two legs go back on top of that and one leg go front to the floor. Beware that you will probably get stitching issues due to the proximity of the camera inside the car, I would recommend doing duplicate scans on each location and rotate the camera approximately 30 degrees so you can choose the lesser of two evils if you get bad stitching errors. I'm new here and am getting ready to order my Pro2, and I just discovered this website the other day, so I am excited! As it happens, my job is Digital Marketing Manager for a car dealership at present, and this vehicle scan idea obvious has my piqued my attention. With 2 scans you get a nice shot, I'm willing to experiment with more but DroneProjects, if you were willing to share a suggested price to scan one vehicle, I would appreciate that. Thanks to everyone, I'm impressed with this community. 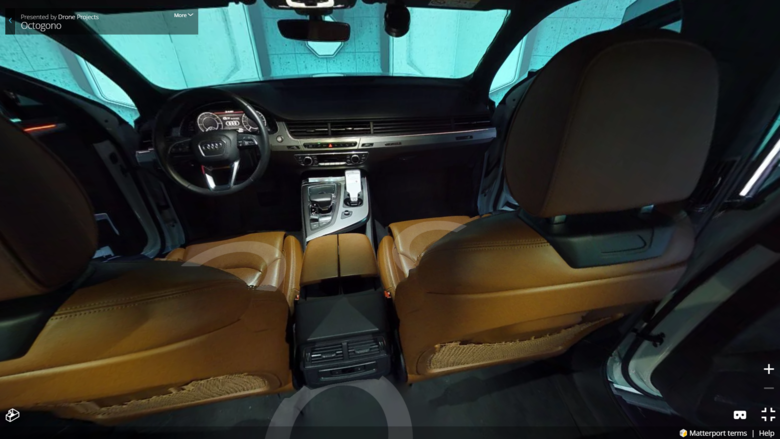 It's perfect for easy, fast and affordable 360ºs of used cars to show the exterior. If you would like an intro to this company to explore licensing their app, please Private Message me. P.P.S. 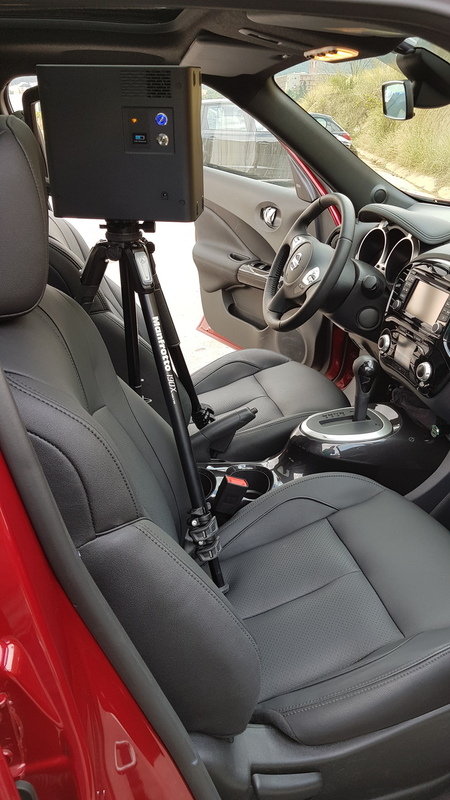 For the interior 360º of a used car, I would use an under $500 1-click 360º camera: not Matterport. I think that using Matterport is great if you are providing a separate scan of each row of the vehicle as the transition effect is quite compelling. I think that if you are wanting to also use the dollhouse view, then you will need to do this in a room with controlled light and also scan the exterior of the vehicle. Otherwise, I would disable the dollhouse view. I have an idea.... just call guy who did the scan! His number and email is under more! Thanks all, and I think definitely the Matterport takes everything to the next level, so we'll see. 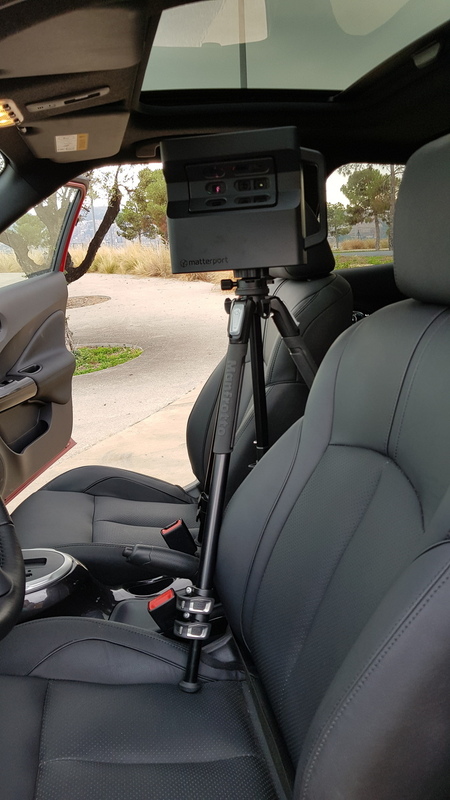 today I did a test with my car, apparently, this tripod fits perfectly and is quite stable. 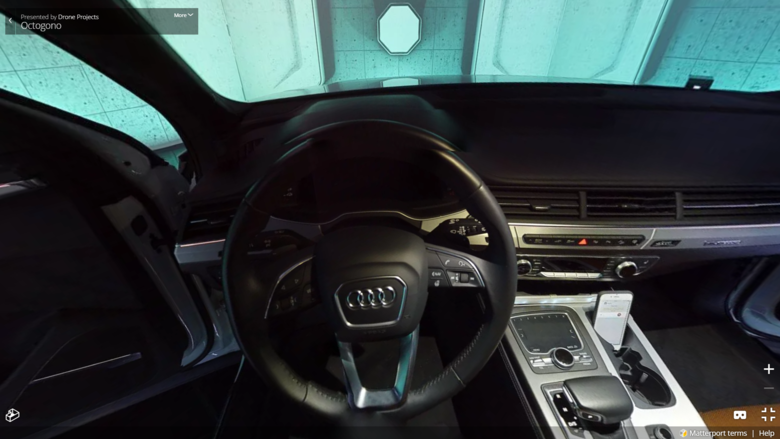 I've only tried 360­­ views, I'm completely satisfied with the results.Let's see how much room has the Audi Q7 e-tron quattro that I should scan this week. Many thanks to all for your tips, I'll keep you informed of the results. PD.some of the pics have been taken before leveling the camera, no panic! We also tried this several times with the MP Pro 1 and always had problems (stiching errors) inside when the distance was to close (headrests). Has this improved with the Pro 2? The result is very good, we're happy satisfied. Thanks to all for your tips, we hope that this post can be used as a little guide for many other MSP. Here is the complete project. Many thanks for all your tips. 360º Video 1 of 3: EVOX IMAGES CEO David Falstrup and Vice Chairman/International Advisory Committee Dave Weber interviewed by We Get Around Network Founder Dan Smigrod at Atlanta Tech Village. 360º Video 1 of 2: EVOX IMAGES CEO David Falstrup and Vice Chairman/International Advisory Committee Dave Weber demo EVOX VR with We Get Around Network Forum Founder Dan Smigrod at Atlanta Tech Village. 360º Video 3 of 3: EVOX IMAGES CEO David Falstrup and Vice Chairman/International Advisory Committee Dave Weber demo EVOX VR with We Get Around Network Founder Dan Smigrod at Atlanta Tech Village. My son and I had an opportunity to shoot a Mercedes (Maybach) S560. Unfortunately the interior was black and proved difficult to light. We did put a hood light on top of the car, but I think that made the interior look grey in some views. In hindsight, we probably should have taken it outside for some natural lighting. You be the judge. We shot a Mercedes S550 with a white interior prior to this that looks 100 times better. It should be listed earlier in this posting. While I'm not a fan of white interiors, I'll take it any day for photography! Why were you scanning this car? Was this for the challenge of it to see what's possible or a paid gig? 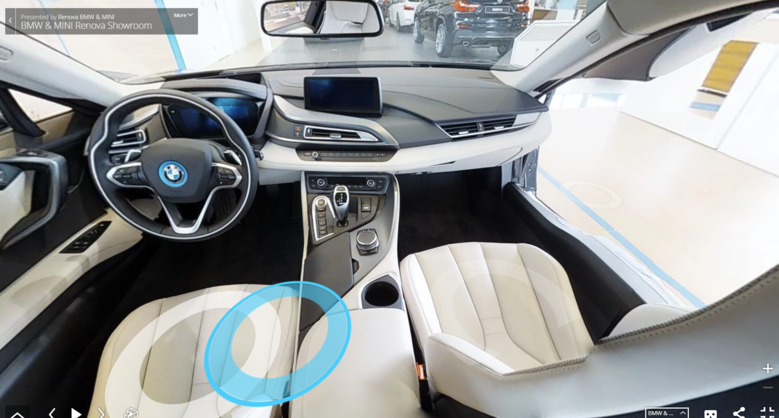 Matterport feels like the wrong tool to scan the interior of a car. I should imagine shooting the interior of a used car with an under $500 360º 1-click camera set to HDR. While it is a creative challenge trying to use Matterport, I can not imagine that the economics work out and the likely bad stitching of objects that are close to the Matterport Camera. This was one of those "let's try this for fun" scans. My son photographs cars for a living and he gets his hands on some pretty nice rides every now and then. It's not often that one gets to play with a $177,000.00 vehicle. As an alternative, I was going to try and scan a Smart car as a comparison! Not sure the Matterport camera would even fit. Another reason is that it allows me to experiment with Mattertags. This particular model has a little bit of everything. I agree, Matterport isn't the right tool for cars. I have considered approaching limo services and RV companies. Some of those motor homes can get up to 40 feet in length which could make for a better 3D tour.